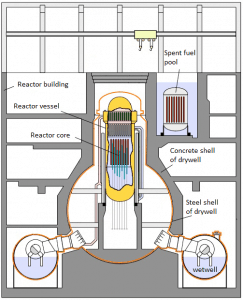 The containment building is a gas-tight building (shell) or other enclosure around a nuclear reactor and a primary circuit. 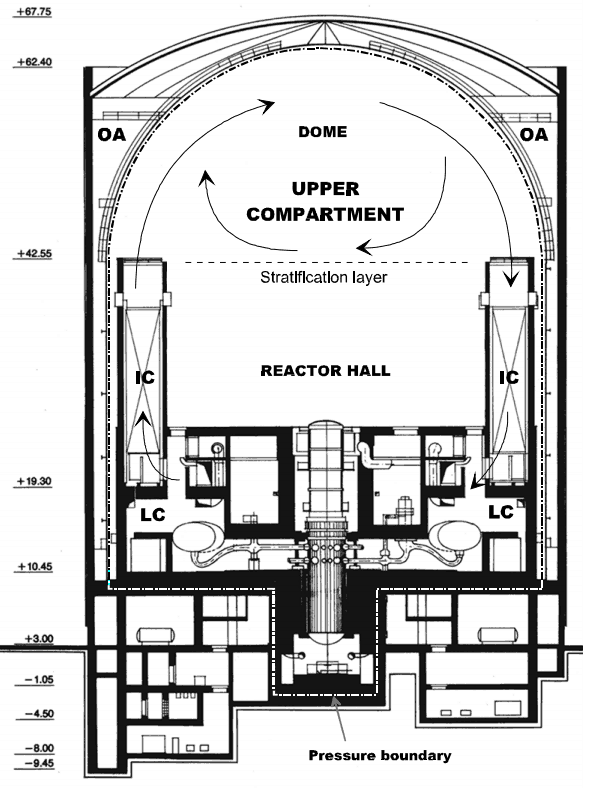 The containment is the most characteristic structure of a nuclear power plant. Practically all nuclear power plants built during the last few decades include a containment building. Confinement. Confinement of radioactive material in operational states and in accident conditions. Shielding. 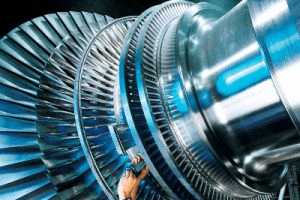 Radiation shielding in operational states and in accident conditions. The International Atomic Energy Agency (IAEA) defines the Confinement as a prevention or control of releases of radioactive material to the environment in operation or in accidents. Confinement is closely related in meaning to containment, but confinement is typically used to refer to the safety function of preventing the ‘escape’ of radioactive material, whereas containment refers to the means for achieving that safety function. 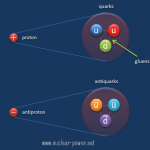 The Containment refers to methods or physical structures designed to prevent as low as reasonably achievable the dispersion of radioactive substances. The containment building is primarily designed to prevent or mitigate the uncontrolled release of radioactive material to the environment in operational states and in accident conditions. Therefore it is considered to be the fourth and final barrier in the Defence in depth strategy. 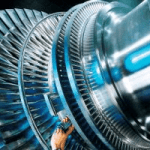 While the containment plays a crucial role in Design Basis Accidents or in Design Extension conditions, it is “only” designed to condense steam from primary coolant and to contain it inside the building. 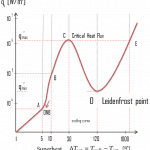 In case of Design Basis Accidents such as the Large Break Loss of Coolant Accident (LBLOCA) the pressure increase is usually significant and active containment systems (pressure-suppression systems) must be available in order to maintain the integrity (to keep the pressure and temperature under certain limits) of the containment building. Full pressure dry containment (PWR). Dry containment envelope is a steel shell or a concrete building (cylindrical or spherical) that surrounds the NSSS (Nuclear Steam Supply System). During normal operation a prescribed negative pressure is maintained by a fan cooler system. During accidents the pressure-suppression and the heat sink can be accomplished by a fan cooler system or by a containment water spray system. Full pressure double wall containment (PWR). This containment usually consist of a primary containment shell (a steel or concrete shell, basically cylindrical or spherical in shape) and a secondary confinement building (a concrete shell surrounding the primary containment). The principle of the primary containment is similar to that of the full pressure dry containment. The secondary confinement building protects the systems and components against external postulated initiating events and captures leakage from the primary containment. Bubbling condenser containment building (PWR). The bubbling condenser containment system uses a concept for the suppression pool or suppression pools in which the high pressure steam following a LOCA or a MSLB conditions is directed through submerged tubes into pools of water. In this pools the steam is condensed and this acts against the pressure increase. Ice condenser containment building. The ice condenser containment system uses a concept of ice chambers in which the high pressure steam following a LOCA or a MSLB conditions is directed into chambers containing baskets filled with ice. In this chambers the steam is condensed and this acts against the pressure increase. Drywell. A drywell houses the reactor coolant system. Suppression pool or wetwell. A wetwell is a suppression chamber, which stores a large body of water and therefore it is commonly called as the suppression pool. Containment envelope. 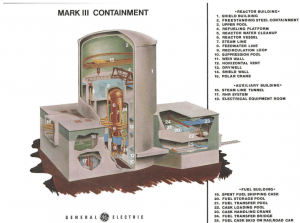 The Mark III containment has a leak tight, cylindrical, steel containment vessel. This vessel surrounds the drywell and the suppression pool. The purpose of the drywell and the wetwell (suppression pool) is to reduce the pressure if a LOCA or a MSLB occurs. The steam from a leak in these cases enters the drywell and is directed through submerged tubes into the water of the suppression pool (wetwell), where it condenses, and the pressure in the drywell is reduced. A containment envelope comprising a prestressed, post-tensioned concrete reactor building. A large dousing tank, which is elevated around the building dome and a powerful spray system. 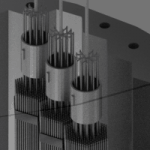 Some units use a multi-unit vacuum building, where more containment envelopes (more units) are connected to a common vacuum building with powerful energy and pressure suppression system. Pressure-suppression systems are critical to safety and greatly affect the size of containment. Suppression refers to condensing the steam after a major break has released it from the cooling system. There are many designs of suppression systems around the world. Fan Cooler System. This system circulates air through heat exchangers and filters to provide the cooling of containment atmosphere. Since this system is not sufficient for suppression during severe loss of coolant accidents, the containment spray system must be available as the secondary active pressure-suppression system. When pressure increase inside the containment is indicated, the containment spray system is automatically started and the pumps (usually with 3×100% redundancy) take a suction from the tank (refueling water storage tank can be also used) and pump the water into spray nozzles located in the upper part of the containment. The water droplets, being cooler than the steam, will remove heat from the steam, which will cause the steam to condense. This will cause a reduction in the pressure of the building and will also reduce the temperature of the containment atmosphere. The spray system usually contains extra chemical additives dissolved in the tank to enhance the removal of particular radionuclides from the containment atmosphere. Especially radioiodine, which is of particular importance, can be effectively bonded to potassium hydroxide or sodium hydroxide. Wetwell. A wetwell is a suppression chamber, which stores a large body of water and therefore it is commonly called as the suppression pool. Water spray systems are usually installed in both the drywell and the wetwell. The Mark III design consists of a primary containment and a drywell. 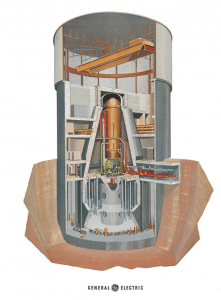 Containment buildings and containment pressure-suppression systems vary widely depending on certain reactor design. In some cases really unique technologies can be installed. For example, the containment building of Loviisa NPP uses two ice condensers as the pressure-suppression system. Containment building BWR Mark-I. 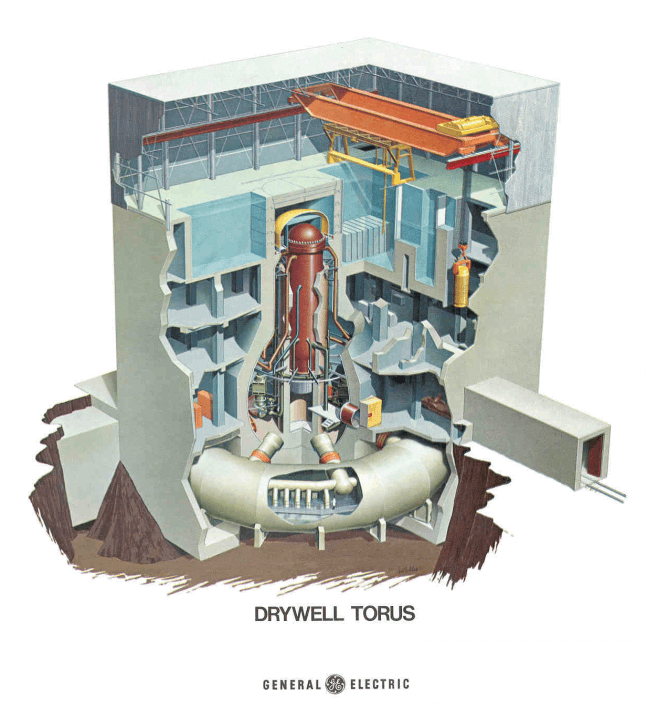 A drywell houses the reactor coolant system. A wetwell is a suppression chamber, which stores a large body of water. This system has many positive features. 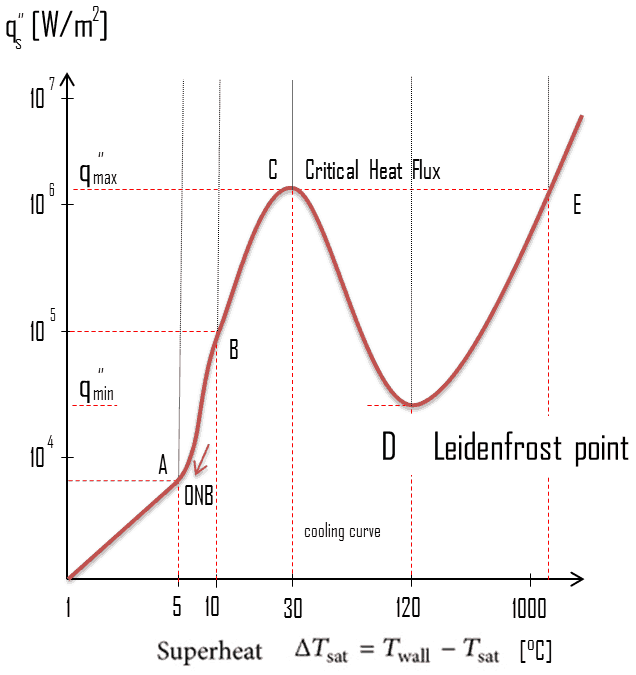 Pressure suppression via ice condensers is very effective because of the ability of ice to absorb high amount of energy during a phase transition. This feature allows containment building to be much smaller than conventional containment buildings. 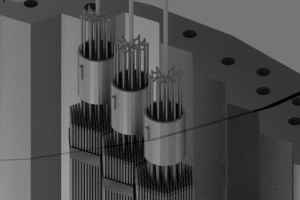 Moreover water from melting of ice can be used for passive cooling and flooding of the small-sized cavity (in the case of Loviisa NPP), where the reactor is located. Ice condenser containments were designed by Westinghouse in the late 1970s and early 1980s, therefore in the United States there are 9 ice condenser containments on 5 sites. Except Loviisa NPP there is one other ice condenser unit in the world, the Ohi plant in Japan. 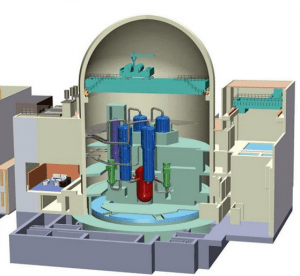 Hydrogen mitigation in water cooled power reactors is an important area of study in the field of safety of nuclear reactors. Hydrogen and oxygen can be generated during normal operation of a power reactor primarily as a consequence of the radiolysis of the water in the core. During DBAs (Design Basis Accidents) such as the large break loss of coolant accident, the production of hydrogen (metal–water reactions in the core) is limited at low values by the operation of the emergency core cooling systems. Also the radiolysis of the water in the core is relatively slow process. Therefore, from the DBAs point of view the hydrogen hazards can be eliminated by maintaining the local hydrogen concentration below its flammability limit (4% of volume). This requirement can be ensured by mixing devices or thermal hydrogen recombiners. In the past two decades, research activities to analyse the threat of hydrogen in a post-accident condition have focused mainly on the mitigation of hydrogen hazards in severe accidents. In severe accidents consider the possibility of the large scale core degradation and even the possibility of molten core concrete interactions. For these cases the capacity of conventional DBA hydrogen control is insufficient. During severe accidents, local hydrogen concentrations can exceed its flammability limit in a short time. analysis of the hydrogen threat in post-accident containments is complex and highly plant- and scenario-specific. Avoiding of formation of flammable mixtures by oxygen control. Avoiding of flammable or detonable concentrations of hydrogen by controlled ignition. Passive or active air mixing systems. Post accident dilution (PAD) of containment atmosphere by inert gas injection. Controlled ignition by deliberated ignition system (DIS). USNRC Technical Training Center, Pressurized Water Reactor (PWR) Systems, available on www: < http://www.nrc.gov/reading-rm/basic-ref/teachers/04.pdf>. 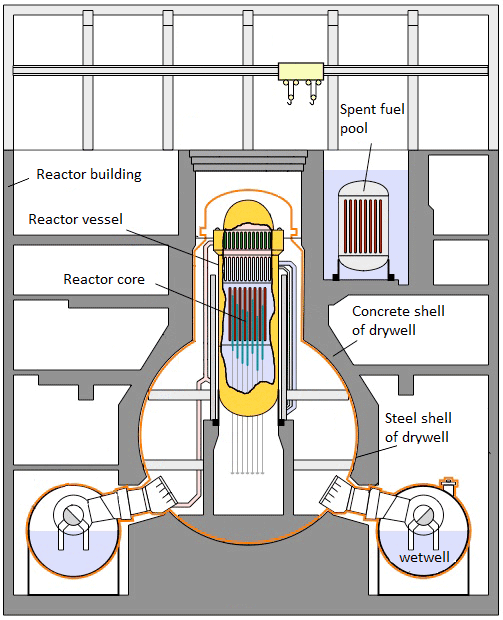 USNRC Technical Training Center, Boiling Water Reactor (BWR) Systems, available on www: < http://www.nrc.gov/reading-rm/basic-ref/teachers/03.pdf >. 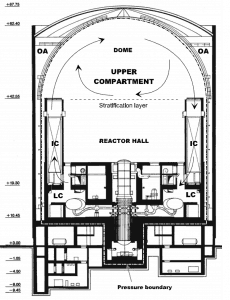 IAEA Safety Standard Series, Design of Reactor Containment Systems for Nuclear Power Plants, NS-G-1.10, Vienna, 2004.